The drop cloth was cut into three pieces. I’m really into liquid water colors lately. If you don’t have some already, go get them, soon! They come in large bottles for school use. For most projects you dilute, but for this one, we used them full strength. This was fun, easy and surprisingly, not messy. I learned this technique from the inspiring Art and Creativity blog by Anna Reyner. 9×10 drop cloth, paper on one side, plastic on the other. This is the banner paper. They also sell this as liquid watercolor mural paper at educational supply stores, but the hardware store is cheaper. Filter paper leaves, the came pre-cut and ready to go! During our recent potluck, I laid the drop cloth on a table and placed some of the filter leaves on top, randomly. All ages were invited to come up and spray! I made sure that younger children didn’t oversaturate the paper. 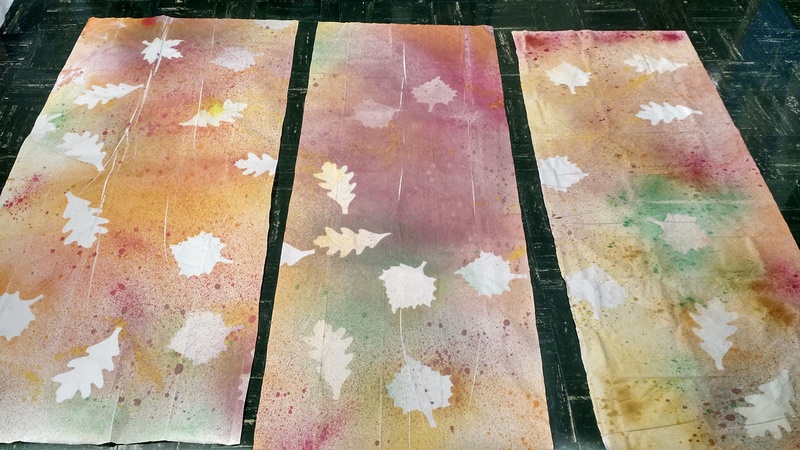 We ended up with a huge mural, and the beautiful leaves! On Monday, I cut the drop cloth into three sections to become the banners.Long sticks from my yard hold the top of the banners. I rolled the paper over the stick and duct taped the back. Voila – three banners. I’m still thinking about how to use the gorgeous leaves. The art will be in our sanctuary throughout our stewardship season; the theme is “My gift matters.” I think that the fact that even younger children are able to contribute to our worship space sends a lovely message that indeed, our gifts matter.